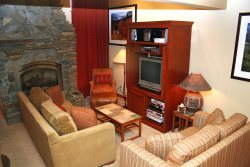 Upgraded Two Bedroom & Loft & 3 Bath Condominium in town near the Sierra Star Golf Course and the shuttle route to the Eagle Lodge Express Ski Lift Area in Mammoth Lakes. Sleeps up to 7. Second Story unit with 2 levels. The Master Bedroom has 1 King Bed. The second bedroom has 1 Queen Bed and the Loft has 3 Twin Beds. There is 1 Queen Futon in the Living Room.Flat Screen TV in Living Room with a DVR player, flat screen TV's in each bedroom and the loft. Wifi Internet access in the unit. Washer & Dryer in the unit. There are 2 outside parking spaces available. There is a game room with a billiard table, a ping pong table and a video game in the lobby of the Sunshine Village condos. In the summer you have access to BBQ areas throughout the complex and a Tennis Court near the swimming pool at Sunshine Village. Coin-operated laundry facilities located in the common area near the office. COMPLIMENTARY INTERNET and CABLE TV are provided, however NO REFUNDS will be given for connectivity problems or Internet failure. TOT LICENSE 3390-SV148. Amazing place! .2 miles away from Vons Grocery Store and 1.2 miles away from The Village! The Redline and Purple Line bus station are within .2 miles from the unit as well!!! Loved this place! Thanks for your hospitality. We loved our stay at your home! Great host, beautiful & spacious house! My group had a wonderful stay for a long weekend in Mammoth. The house was exactly as advertised. We especially loved that parking was easy and right in front of the home, and that the home was located very close to all of the amenities and resorts of Mammoth. The check -in and check-out process was also seamless. Would definitely recommend this home to others! Very clean and cozy place, modern kitchen and great open layout for big groups. Plenty of parking, easy to find, fast responses, We had a wonderful time! Thank you very much! Thank you host for a wonderful place to stay. Your place was nothing short of its description! In fact, I thought it was far better! Comfy beds, cozy feel, CLEAN, spacious, great location, and fully stocked with the necessities. If anybody is looking for the perfect condo in Mammoth, dont look any further. This place was worth every penny! Again, thank you host for the perfect stay! A great place! Clean, comfortable and a short drive to the lifts and restaurants. Thanks! We had a great stay. It was a perfect place for our trip. We had a great time at our condo. Beds were comfortable, place was well heated, beautiful fully-equipped kitchen. Great condo! Check-in was super easy with lock boxes, and the layout of the condo was nice and efficient. Kitchen was remodeled and done really well. Place was clean and the beds were comfortable. It is located a few blocks away from shops/dining in town so you have to drive to go anywhere but it was nice and quiet. Great place! Will stay again and recommend. Thank you! Our group was very impressed with SV 148. It was close to Eagle Lodge, super close to Vons, spacious, nicely updated and perfect for our group! Exactly as pictured! Not pictured was the well-stocked kitchen with all the essentials for cooking group meals and the fact that all the beds, even the twins in the loft were very comfortable. I was very impressed with how on top of snow plowing the complex was as Mammoth received three feet of snow during our stay. Other than digging our out car after the snow, the road around the complex was clear which made coming and going a breeze. The only minor issue we ran into was the loft bathroom door didnt close completely but it in no way hindered our stay. Everything else was in proper working order and we look forward to staying here again! All in all this is a comfy, well equipped condo with spacious living room and big kitchen! Check in was a breeze and everything look exactly as pictured. Great location. Quiet complex. Walking distance to restaurants and the grocery store. Great overall stay.